From the For Him Collection of rugged bracelets which can be worn every single day. 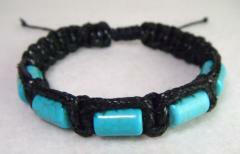 Black waxed cords capture five substantial barrels of turquoise dyed Howlite. The sliding knot fastening makes this bracelet adjustable.